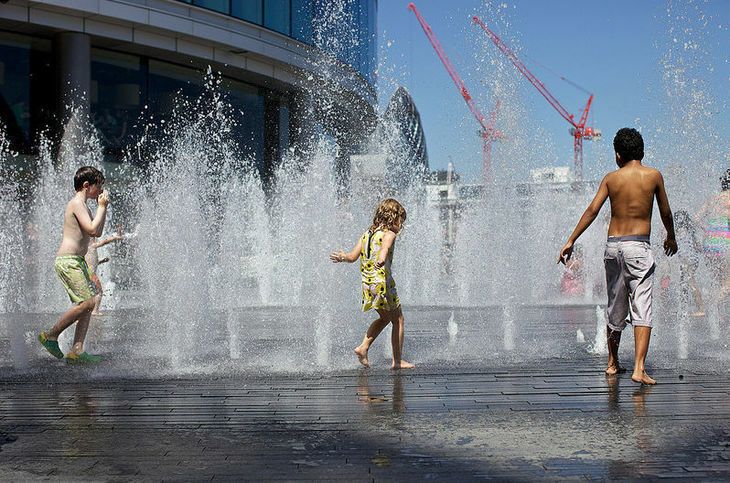 Indulge your inner kid by splashing around in one of these top London play fountains. First installed in 2006, and returning annually pretty much ever since, Jacob Hein's aquatic structure Appearing Rooms has surely become the big daddy of London's play fountains. Jets send walls of water high into the air creating 'rooms'; they then disappear as quickly as they emerge. For some people, Appearing Rooms represents chin-stroking art: the temporary versus the permanent, playing with our perceptions of sculpture and architecture, and conceptual minimalism. For kids, it's about getting as wet as you can, as often as possible, even if it's not 'fountain weather'. Located in Hyde Park, the Diana Memorial Fountain is made of 545 pieces of Cornish granite, making an oval 'stream' in the surrounding grass. There are three bridges you can cross into the centre without getting your feet wet: but really, it's a great place for kids (and grown-up kids) to dip their feet. The two sides are supposed to represent the two sides of Diana's life: happiness in the calmer pool; and turmoil in the choppy waters. Don't worry too much about the symbolism, just be careful not to fall over: three people were hospitalised after falling over when the fountain first opened in 2004. It seems Londoners needed a bit of practise before properly getting into the brilliance of play fountains. These days, Royal Parks ask visitors to sit on the edge and refresh their feet, rather than walking on the memorial. 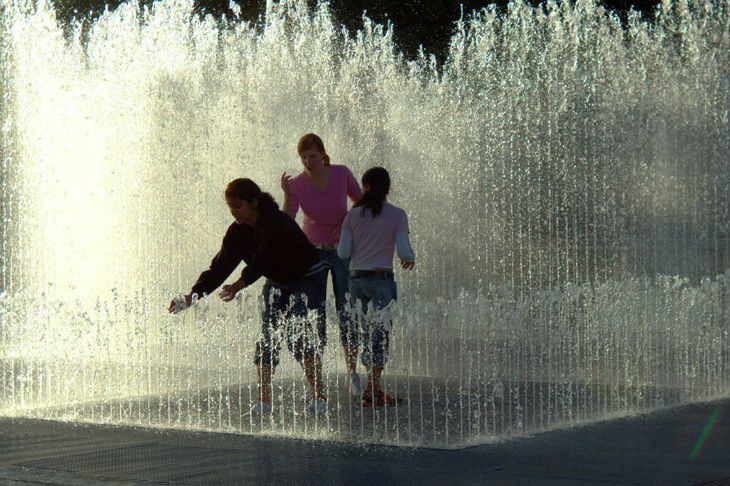 Granary Square features 1,080 individually controlled and lit water jets. 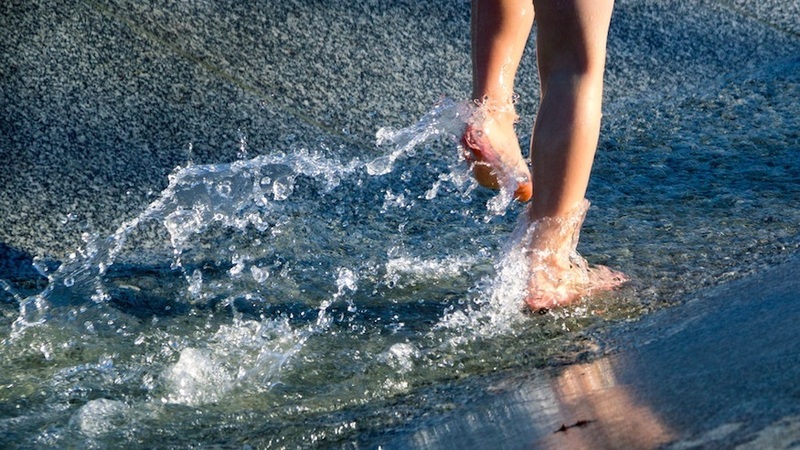 The result is a brilliant splash park for kids of all ages; the perfect way to cool off on a warm day. They start off quite mellow first thing in the morning, then get more boisterous as the day goes on. Splash! At the Granary Square Fountains. Photo by Daniele Zanni via the Londonist Flickr pool. After dark, their personalities change again, with the addition of colours to the seemingly random squirt patterns. 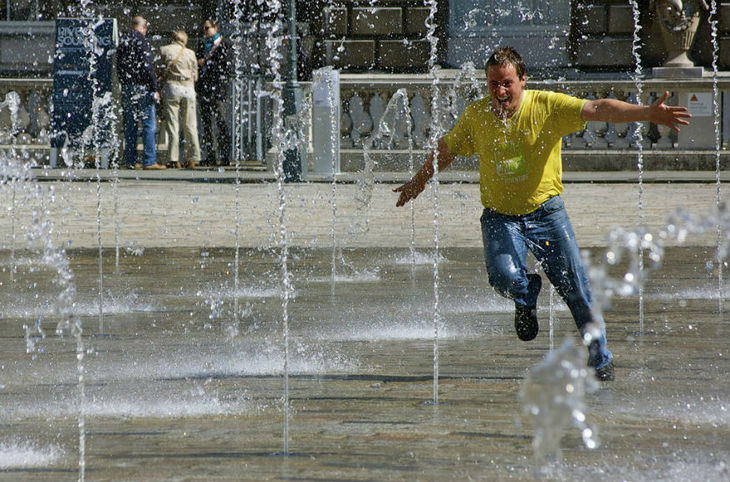 If you need more excitement from your London play fountain, download the Granary Squirt app: from 4pm-5pm, you and up to eight of your mates can control the fountains from your phone. Yes, really. It's a bit like playing Snake, but wetter. Take one straight-laced and highly corporate Carbuncle Cup-nominated London development with a silly name (More London? Is the rest of the city somehow Less London? ), add 200 play fountains, and some other innovative water features. The result is an odd mash-up of suits on mobile phones marching between meetings, and south London mums hollering at soggy, squealing kids. 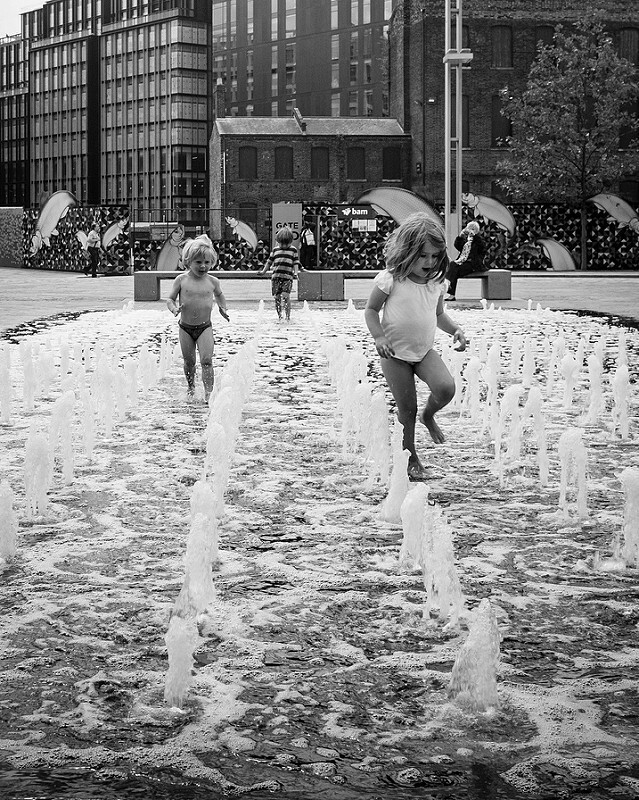 Kids in the More London fountains. Photo by Marco Barbieri via the Londonist Flickr pool. 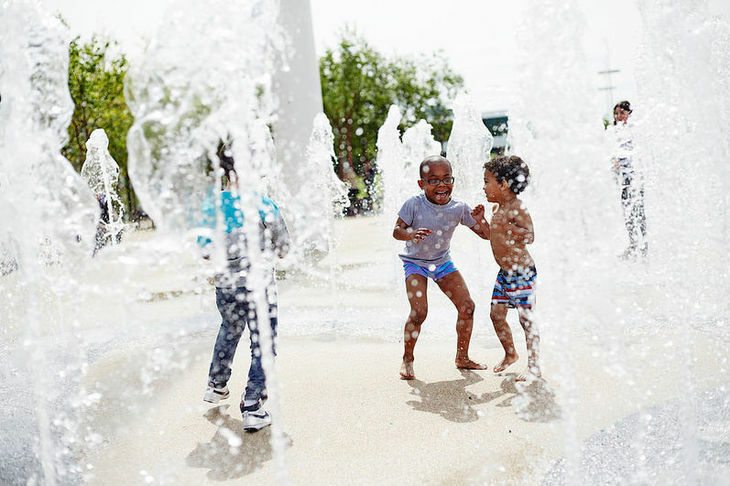 Head to the south of the Olympic Park to find the Waterworks Fountains; 195 individual jets creating walls of water in a kind of maze to splash through and cool off. Just remember: the fountains aren't available on major events days. Cooling down at the Olympic Park. Photo by Katie Howey via the Londonist Flickrpool. Inside the inner courtyard at the V&A you'll find a calming elliptical pool dotted with the occasional fountain water jets. It's a fantastic space to sit and enjoy some tranquility after the bustle of the museum. And on hot days, it makes for a very sophisticated, secluded paddling pool. The 55 jets that make up the playful Edmond J Safra Fountain Court inside Somerset House aren't always available to run around in. Check out the Somerset House website before you visit to avoid disappointment/going home without getting your feet wet. 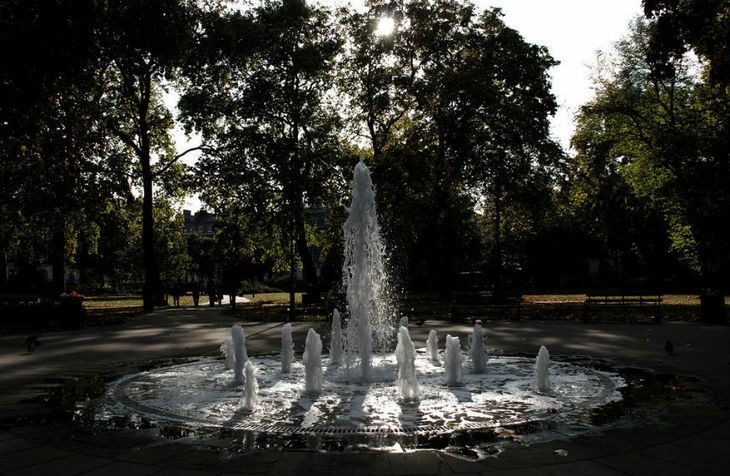 The pretty garden in Bloomsbury's Russell Square gained a fountain when it was re-landscaped in 2002. It gushes from the centre of the square: small, yes, but still offering a perfect paddling opportunity for kids and kidults alike. 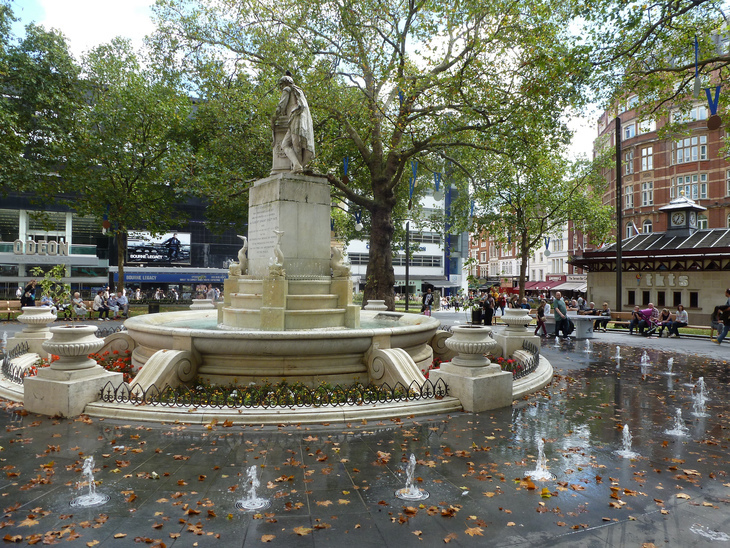 Following a couple of spruce-ups (in 2012 and 2014), Leicester Square now boasts a lovely play fountain surrounding the statue of Shakespeare in the centre. Shakespeare and a newer play fountain, in Leicester Square. Photo by Taigatrommelchen.